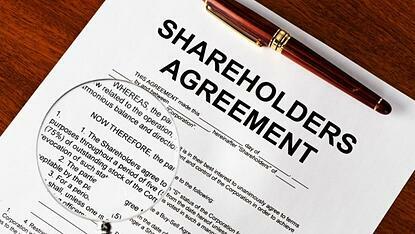 Shareholder agreements: what, exactly, are they? How will they help you form the backbone of your dental practice? If you're thinking about forming a partnership with another dentist, especially if you're thinking about forming a partnership with several dentists, it's important that you understand the distinction between shareholder agreements and partnership agreements--and how shareholder agreements can help improve the functionality of your practice. What Does a Shareholder Agreement Accomplish? Buy-sell rights: What happens when one party no longer wants to be part of the practice? How will you handle conflict if one entity no longer wants to be part of the agreement? Do you want the other parties involved in the shareholder agreement to have first rights to buy out another party? Your shareholder agreement should clearly cover how you will handle any need to sell the practice. Disability: What happens if one dentist becomes disabled and is no longer able to effectively complete their daily job duties? This might include disability due to age or injury. You may decide that they can still be a financial partner in the business or that they need to sell out as soon as possible. Your shareholder agreement should also set out terms for short-term disability: what if one shareholder is temporarily injured and will be out of work for several months? How will you handle this scenario? Rights: Who has the majority right to the practice? This might be the party who is putting in the greatest financial contribution up front or the one who sees the greater number of patients over the course of the business day. This may impact voting rights, including who has the ability to make the final decision in the event of a dispute. Potential compensation concerns: Will one member of your practice be working more days or seeing more patients than another? How will you handle compensation in this instance? Many dentists, when they start building a partnership, choose to divide compensation by percentages. If one partner consistently sees more patients or contributes more to the practice, it may be that they need to receive a higher percentage of the overall profits. Financing issues: There will inevitably come a time when financial issues arise in your practice. Sometimes, you'll need to roll more of the profits into the company to handle rising expenses. In other cases, you may need to be able to come up with capital for unexpected financial issues. Take the time to set out how you'll handle these financial challenges ahead of time so that you aren't blindsided when they do appear. Death: If one member of the dental practice dies, what happens to their shares? You may assume that they'll automatically be passed to the other members of the practice, but that might not be the case. Some dentists may want to leave a portion of their shares to other members of their family--including those who may not have the ability to take over their portion of the practice. Competition protection: Your dental partnership simply isn't working, and one member of the partnership decides that they want to dissolve it. What next? You don't want that partner to head to the empty space next door and open a new practice, potentially taking away half or more of your customer base in the process. Your competition protection may include how long one member of the practice must wait before opening a competing practice or how far away a new practice must be. Consult with a dental lawyer. Dental lawyers have extensive experience in forming shareholder agreements and other key elements of the partnership. By working with a lawyer, you can form an agreement that meets both your needs and your partner's needs. Make sure you understand the potential implications of the agreement. When you work with a good lawyer to form your shareholder agreement, they'll ensure that you understand the potential implications of your decisions--including how specific scenarios could play out down the road. This will help both you and your partner make wiser long-term decisions. Make sure, as you're considering those implications, that you take your future plans and desires into careful consideration! Keep communication open. You want to open a dental practice, not spend hours bogged down by the legal pieces. Keeping communication open throughout the process, however, can make a big difference in the partnership agreement you ultimately form--not to mention making both you and your partner more comfortable with the outcomes. Keep in mind that in many cases, you'll be spending more time with your dental partner than you do with even your spouse. You want to learn how to communicate early in the process so that future issues will flow as smoothly as possible. Pay attention to the details. Do you have specific areas of concern--perhaps horror stories that you've heard about other partnerships gone wrong? If so, make sure that those key areas are carefully covered by your agreement. If you're ready to start crafting the shareholder agreement for your dental partnership, contact us! We'll sit down with you and make sure that you understand all the important details of your shareholder agreement and that you're prepared for the implications of your decisions--and that both you and your partner are as happy as possible with the outcome.